Wind Farm Interference on Microwave Links: Is it a Real Problem? Microwave links can traverse orbits of large industrial wind turbines. New studies are needed to examine the effect of turbines on modern microwave link technology. Photo credit: mcdlttx (D Turner) via Flickr. Since the 1980s, there has been concern about the potential interference that wind turbine farms can cause to wireless communication equipment. The focus has been on TV, civilian and military radar and point-to-point microwave systems. This led to studies to evaluate the degradation effects that wind turbine farms have on these systems. They concluded that physical propagation effects such as dispersion and diffraction of electromagnetic signals propagating through wind turbine farms produce low-level, long-delay, multipath distortion on telecommunications equipment  . In recent years, these conclusions have been used to recommend an overzealous approach to the design of digital microwave paths that go through or over wind turbine farms. Overzealous recommendations with little supporting evidence have made it standard operating procedure to establish “exclusion zones” around wind turbine farms . In the case of microwave links, the technology has made great improvements since the 1980s. In the 1980s, microwave links were analog and more vulnerable to interference and multipath distortion created by wind turbine blades. New digital microwave radios with Forward Error Correction (FEC), Adaptive Coding and Modulation (ACM) and high dispersive fade margin are better equipped to deal with interference and multipath distortion produced by wind turbine blades. These technological advances were not available in the 1980s and 1990s when the most rigorous studies about wind farm interference were completed. Besides the improvements in digital microwave technology, wind turbines have also changed. 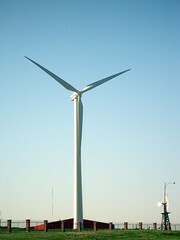 In the 1980s they were smaller (compared to contemporary units) and mostly made of metal; today wind turbines are bigger, and the blades are mainly made of reinforced fiberglass, which is transparent to microwaves. Although obstruction due to the wind turbine pole and generator case will create path loss and possible diffraction of the signal, poles and casings are very thin (compared to the Fresnel zone radius) and would have to be in the direct line of sight of the link to produce significant penetration loss. Although a conservative approach to microwave path planning is always recommended, and detailed planning and path surveying for each path are necessary, an overzealous design based on outdated studies can lead to unnecessary CapEx and OpEx. More rigorous studies based on detailed field measurements with high performance digital microwave wireless communication equipment must be undertaken to establish wind turbine clearance criteria based on current technology and field measurements. A good starting point can be to check current links that are intentionally or accidentally traversing the orbits of a wind turbine blade. Aviat Networks would be like to hear from users that have this situation (leave a comment for this blog). Further analysis of a link in this condition can prove or disprove the hypothesis that modern microwave radios are relatively unaffected by modern fiberglass wind turbine blades and thin wind turbine pole structures. If this hypothesis is confirmed, current guidelines can be relaxed to avoid passive repeaters and bigger towers that represent additional costs.